Shanghai-based foodie and restaurateur Lindsey Fine (aka Veggie Mama) has been creating all sorts of delicious vegan recipes since moving to China eight years ago. You can read all about the perks of eating a plant-based diet via her blog Veggie Mama and sample recipes on this series, Cooking with Veggie Mama. In this edition, Lindsey shares her recipe for Vegan Hot and Sour Noodle Soup. I love soup so much. Luckily I live in a country where about a billion other people love soup too. 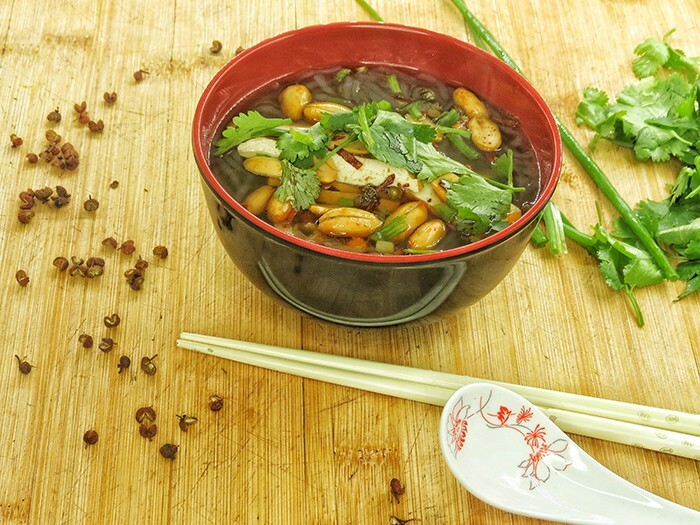 Here in China, soup isn’t just reserved for winter, it’s enjoyed all year long. This particular recipe uses chewy and delicious sweet potato noodles. These noodles are fairly easy to find in local markets. They are gray in color and hard as a rock. They will need a bit of time to soak before cooking but they are totally worth the effort. Just make sure not to overcook them because they will lose their wonderful texture. 1. Place the sweet potato noodles in a bowl and cover with water. Soak for about 30 minutes, until pliable. 2. Heat cooking oil over medium-high heat in heavy bottomed soup pot. Add garlic and white part of scallions and cook for 3 minutes. Add whole Sichuan peppercorns and sauté for an additional 2-3 minutes, until fragrant. Reduce heat as necessary so as not to burn the garlic and onion. 3. Add vegetable broth and bring to a boil. Add sweet potato noodles and cook for 5 minutes. 4. Add soy sauce, vinegar, five spice, ground Sichuan pepper, chili oil and salt, cook for an additional 2-3 minutes, making sure not to overcook the noodles. 5. Remove pot from heat. Remove noodles from pot and place in serving bowls first, then spoon the broth on top. 6. Add garnishes in whatever amounts you desire and slurp that soup up! Make this a super filling meal by adding seasoned tofu slices on top.